Publisher announces sequel almost four months after the original. Uh-oh. Video game publishing giant, Activision, mostly knows a good thing when it sees it, an eye for potential that eventually leads to millions. Some would also say the company has a nasty habit of running successful franchises into the ground, as it arguably did to Tony Hawk and Guitar Hero, with the immensely popular but oft criticized Call of Duty perhaps the latest victim. Graphics not indicative of handheld/smart phone versions. To that we say, please don't do the same to Skylanders. We'll admit to being concerned. 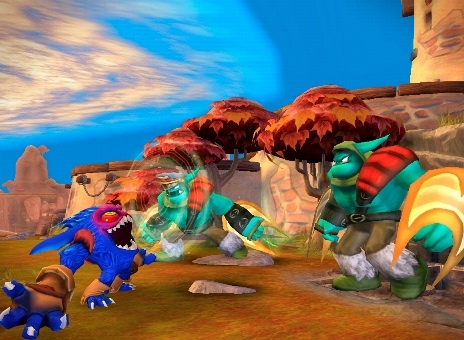 The first game, Skylanders: Spyro's Adventure, was a runaway hit many didn't see coming, a title that perfectly fuses plastic toys with 3D action. It was so well received, that the game rocketed to become the number one best selling kids franchise worldwide in 2011, as well as the number one new IP to debut in North America over the same period, in a gaming industry that normally turns a blind eye to fresh ideas in favor of proven content. The proof is both in the review scores (we love the 3DS version) and images of empty Skylanders sections in retail stores across the country. Call of Duty who? Thing is, the game debuted in October, and yesterday, Activision held a press event in New York City to reveal the sequel, Skylanders Giants. Granted, it's a bit early to predict the demise of this great intellectual property, and with so much potential to grow, Giants should be a huge hit when it arrives Fall 2012. Developer Toys For Bob designed all new figures (even bigger ones than before), characters with some crazy light up technology (no batteries required) when near a Portal of Power, new modes and forward compatibility with Spyro's Adventure. From the sound it, Giants may stand out as the ideal sequel. At the same time, it feels a bit early to go all in so quickly, and it smacks of Activision's prior dealings, where it delivered so much so soon consumers no longer wanted it. Of course, not everything lasts forever. Kids grow up, new franchises appear and before long, those toys will wind up in attics across the planet, destined to pop up several years later, when the owners (now heading off to college...yes, a Toy Story 3 reference), look back fondly on time well spent. That said, this is a long way from happening. We just hope Activision makes the right decisions to preserve this series' popularity as long as possible. We'd hate to see it die prematurely.